Since I challenged myself to shop for a LARGE amount of meals for the week and then tried to stumble through them as well as I could… I tried really hard to stick to the recipes I had chosen regardless of how well I thought they might be received – though I did try to make sure that the meals I picked (or, pinned) wouldn’t be too far outside the realm of what we usually eat around here. I found this recipe on one of my favorite food blogs – The Kitchn. It’s description probably would have been more fitting, and less nauseating had I stressed/said lasagna noodles instead of having her think that I put all of these toppings inside a regular lasagna, which is, a pretty disgusting concept… I did have a panicky moment of thinking, oh, jesus, this isn’t gonna even look remotely edible to the boy when he gets home… But, what was done, was done. When noodles are cooked, transfer them to a bowl of hot tap water until ready to use. I cooked mine until they were just on the verge of being al dente so that while sitting a few minutes they didn’t get crazy over-cooked. In the same (or separate, however you’ve thought this out, or however many appropriately sized pots/pans you have…) small pot, bring water to simmer for poaching eggs. I like to (or just out of force of habit?) add a bit of white vinegar to the water – my dad always did when he made them, I’m not sure if it makes a difference… Poach your eggs for about 4 minutes each – transfer them (using a large slotted spoon, carefully) to the same bowl of warm water the noodles are sitting in until ready to plate your meal. While your eggs are cooking, begin wilting the greens. Warm a teaspoon of olive oil in a medium – large skillet over medium heat. Add the greens and pinch of salt, sauté them until the chard wilts, turns a bright green, add in your 1/2 can of beans and mix in to heat completely- cook until chard becomes tender, roughly three minutes. Stir in the garlic and red pepper flakes and stir until fragrant, and just combined. 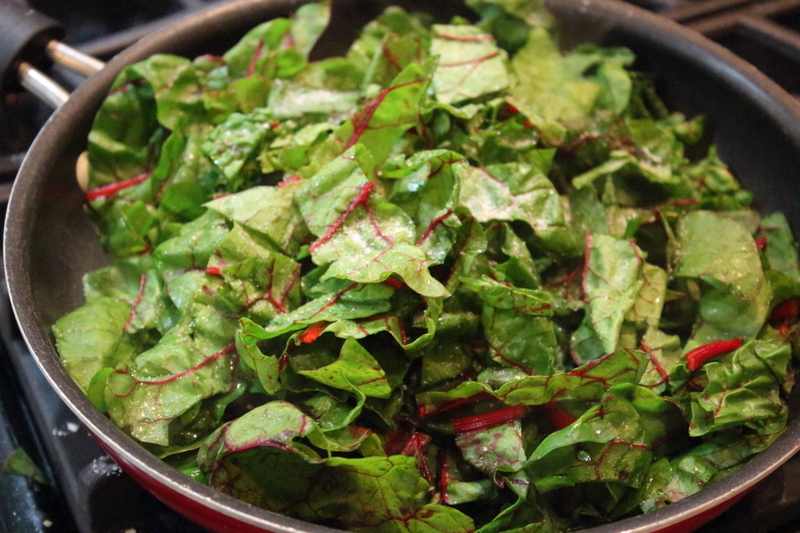 Quickly transfer the chard to a plate. Take noodles from bowl, and pat them dry. Place them on your derving dishes. Drain the water from the prep bowl, and place poached eggs on top of noodles. 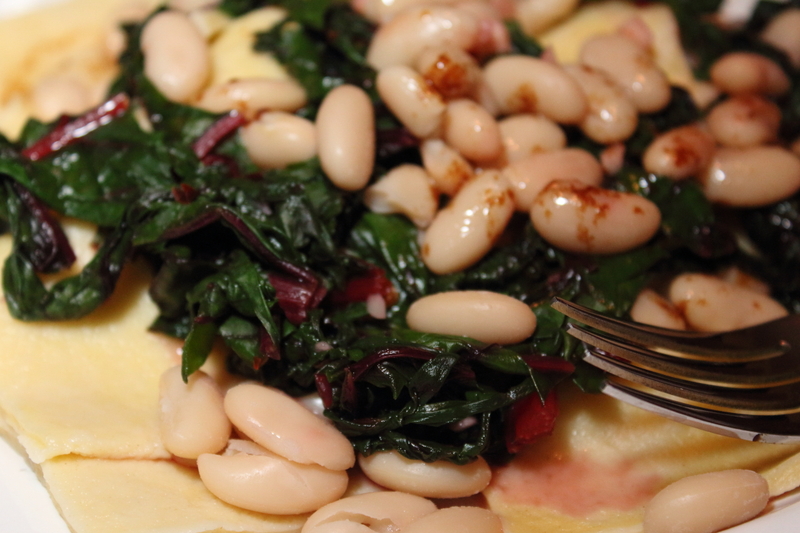 Top with the remaining pieces of noodles and cover with wilted greens, and beans. Drizzle butter sauce on top of everything, and serve immediately before sauce getts cold. Make a mound of flour on the counter and mix in the salt. Make a well in the center of it for the eggs. Break the eggs and add yolks to the well and start to scramble each egg as you add it – use a large fork to mix. 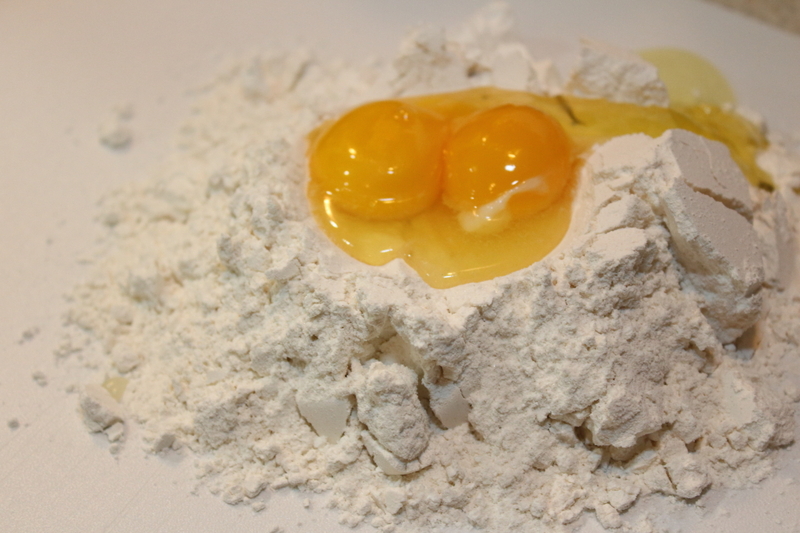 When enough flour is incorporated so that the eggs are no longer really runny, you can start mixing with your hands (be sure to remove any or ALL jewelry at this point as it gets seriously sticky…) until fully combined. Kneed the dough until you have a soft, satiny ball of fough. Wrap in plastic wrap and let it sit for 30 mins. Roll out either by hand or with a machine until it’s about 1/8″ thick (I think that would be #6 on the machine?) 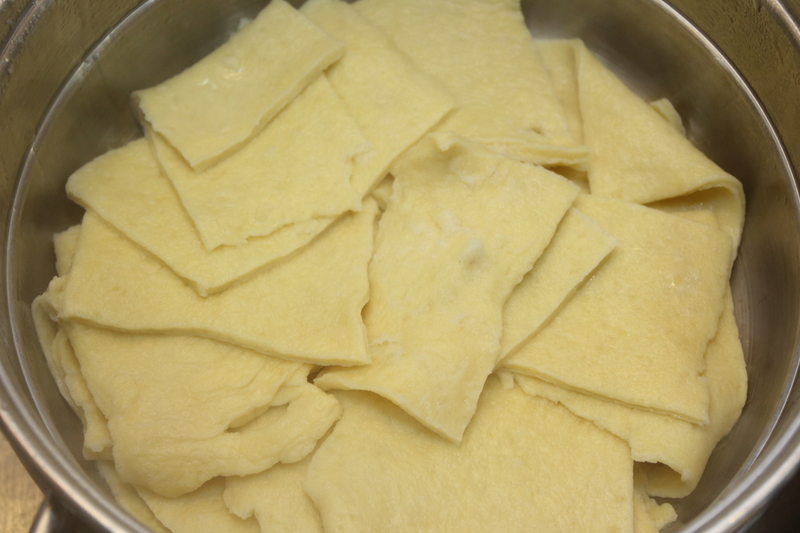 I did this batch by hand, so it was a little uneven and a bit thicker… Cut into strips (I cut into jagged squares for this meal, and cooked until al dente) and if using for lasagna, cook in boiling water for 30 seconds and then bathe in ice water until ready to assemble lasagna. In the end, I really just should’ve held back a bit on the beans. 1/2 a can of beans is more than enough for two plates – I’m not sure why I didn’t actually think that one through… And the boy? He liked it a lot. 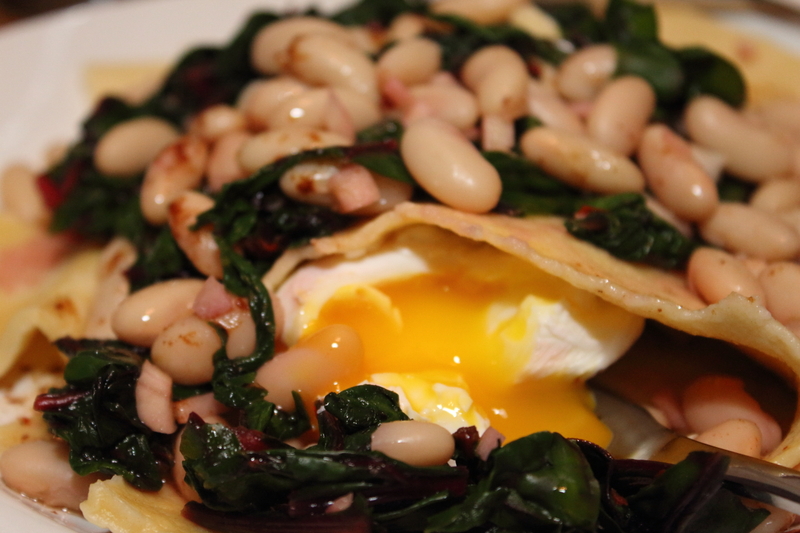 He’s big on poached eggs, and fresh pasta, his only suggestion was… fewer beans. Oy! 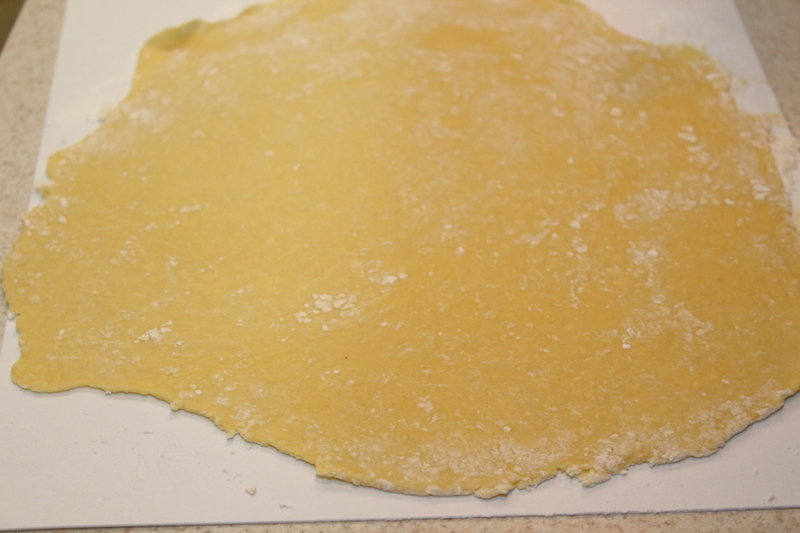 Totally edible, and one of the more interesting recipes I’ve tried with fresh pasta. I can’t wait to make a lasagna with these noodles, since now I’m more experienced with making them. 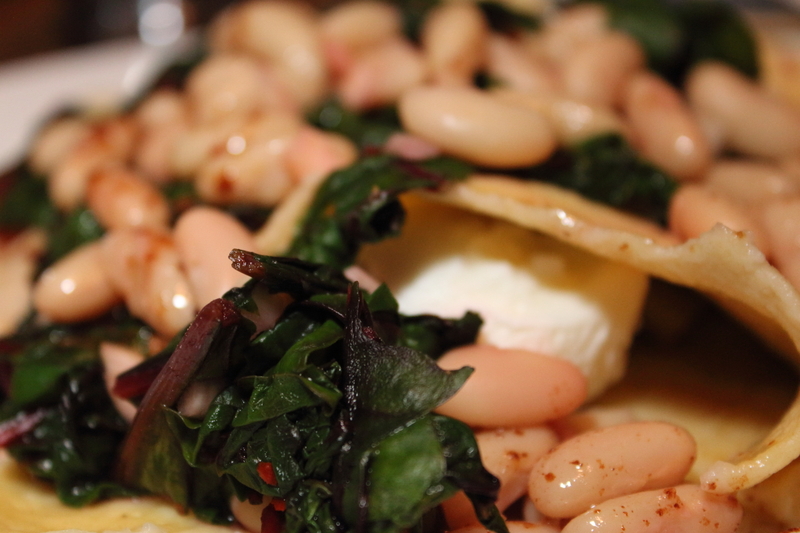 Looks wonderful, love the homemade pasta and the greens and beans are perfect in this dish. Can’t forget that gorgeous poached egg. What a wonderful dish! !